It was going to be close. After a seven mile hike that took three and a half hours, the final 100 yards was going to determine if we won. The silly thing was it was a race with ourselves. The sun didn’t really care. 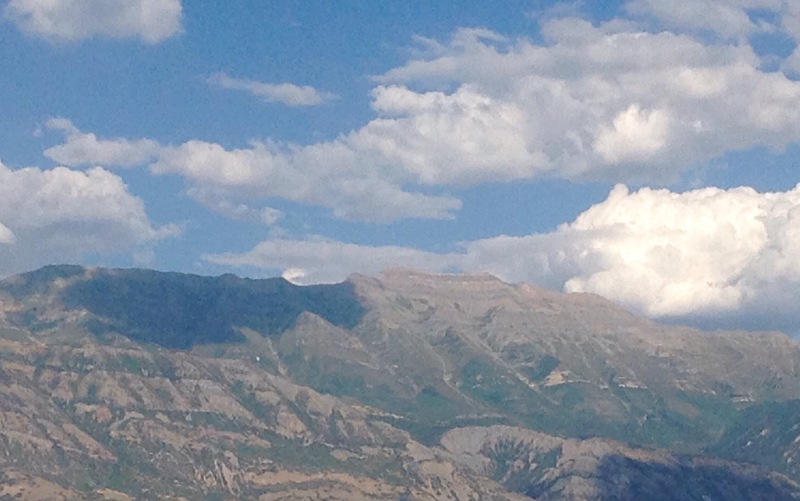 Mt Timpanogos is 11,752 feet high. 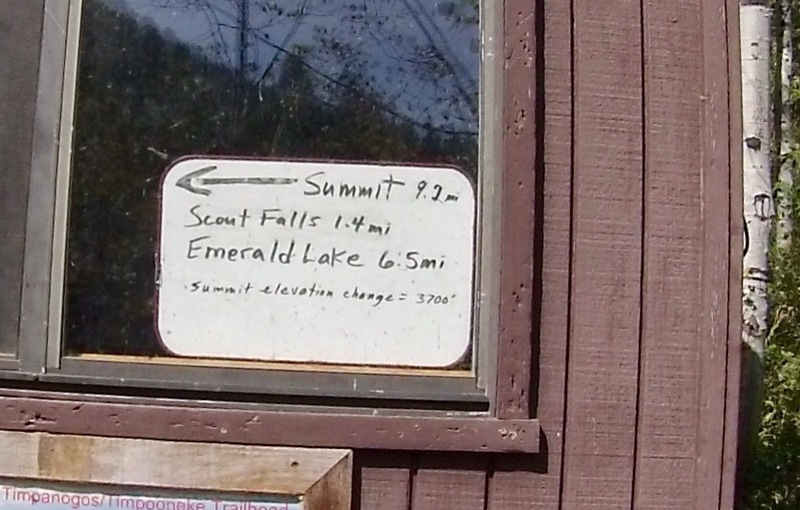 While it would be awesome to say we climbed 11,752 feet in two days, that’s not exactly correct. Actually, it’s a long ways from being correct. My house is about 4500 feet above sea level. The lowest point in Utah is Beaver dam and it’s 2180 feet. The parking lot of the Timpanokee campground, where we had started our hike is 8000 feet. Still, 3700 vertical feet over 9 miles was not a walk in the park. I know, I’ve walked in the park and my knees didn’t hurt nearly this bad. 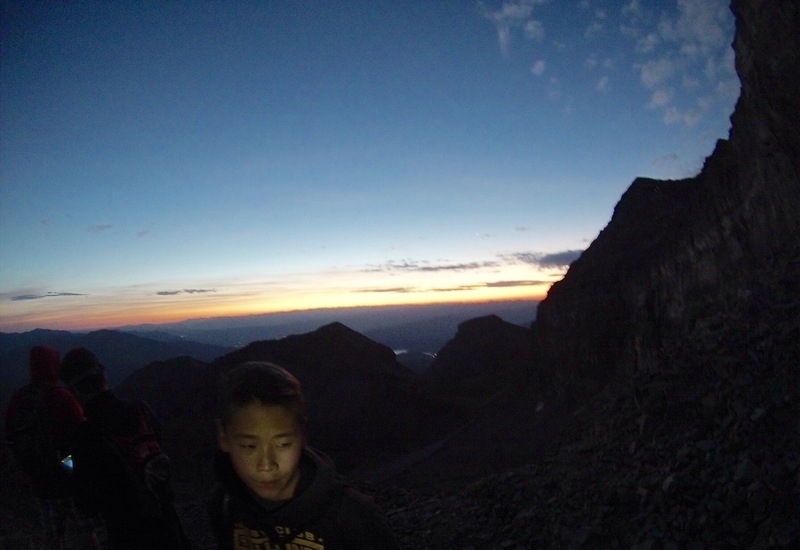 We’d camped at Scout Falls and got up at 3:00 to hike in the dark and chase the sun to the top of the mountain. For the past hour, the eastern sky had been giving us warning that the race was coming to a conclusion. I have a friend who is doing the 30 days No Excuse challenge. The objective is to set a goal and accomplish 30 specific things every day. My friend did it for his health. He cut out soda and has dropped 16 lbs in 2 weeks. He said something interesting today. I have not yet managed to accomplish all 30 goals in a single day. I tried the 30 challenge and found myself frustrated because there were not enough hours in the day. (One of the goals was go to bed early, so I couldn’t simply burn the midnight oil.) I was failing at my challenge. I had plenty of excuses. I beat myself up a little over it. My friend followed up the above statement with one more. It doesn’t matter since I know that I’m improving. I thought of that as we scrambled over the rocks trying to beat the sun to the summit. 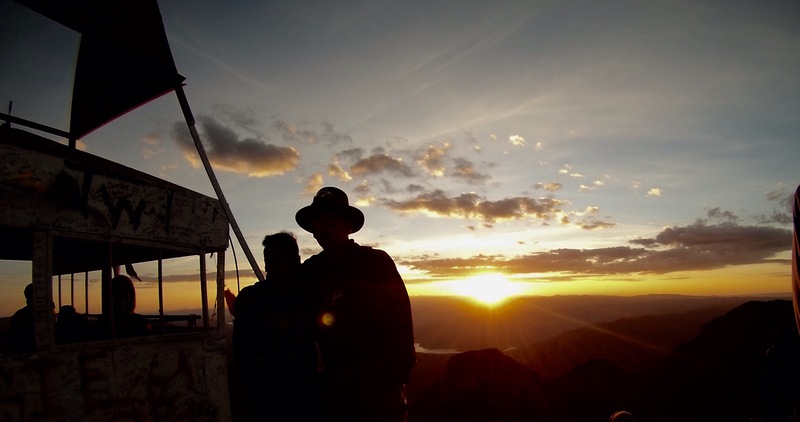 Was the goal to get there before the sunrise? 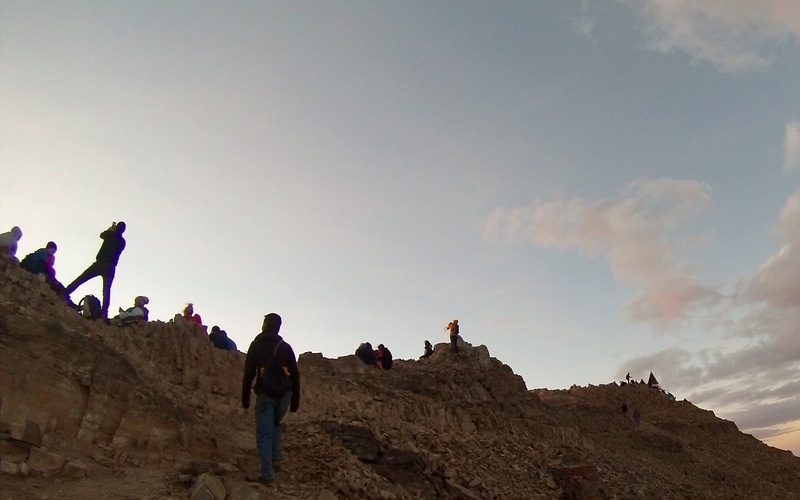 Or was it to accomplish the goal of climbing a mountain? My son and I were 50 feet from the top when a cheer went up from the people at the summit. They cheered the return of the sun. My son could have easily been at the top by sunrise. He’s in great shape and spent the summer running up and down mountains, building trails for the forst service. He chose to stick with me, even knowing that he might miss the sunrise. In fact, he was the reason I was on this hike. I didn’t have time to take a couple days and climb a mountain. But, when he decided he was going, I decided I really had no choice. I chose to go with him. I think the trip to the summit was his way of saying he chose to go with me too. We found the rest of our group. They’d made much better time. They hadn’t needed to wait for the old man and his weak knees. 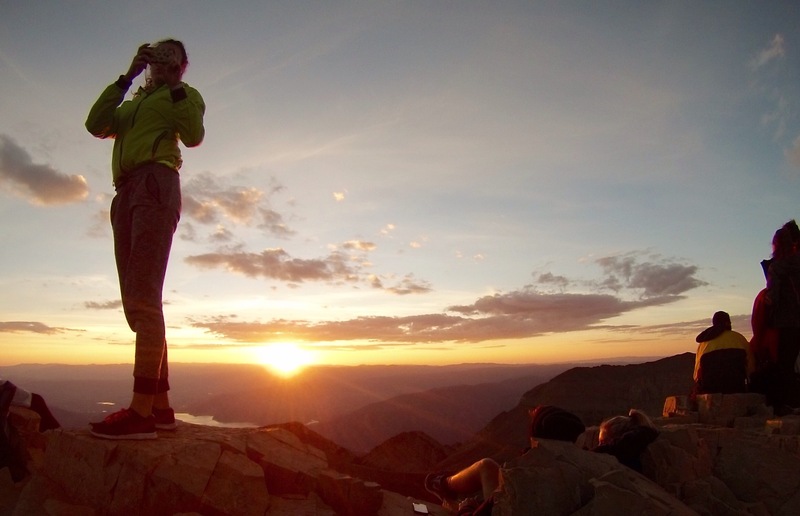 It was kind of fun to share the sunrise with a group of people who had been through the same journey we had. They might have arrived a little earlier, but we’d all made it. We were all part of the same tribe for a few minutes. And we had the sunlight all to ourselves. We paused for one more picture before starting down. We had 3700 feet and 9 miles to get back to the trucks and on about our day. Did the sun beat me to the top? Yup. Did I care? Not a bit. Racing the sun was an intermediate goal, the mountain top was a destination. Spending 9 hours hiking with my son was the reward.